DGLux5 is a multiple-deployment, drag-and-drop interface application development and visualization workspace. It is accessible in browsers with HTML5 and can be deployed in Windows, Apple, and Android devices for full flexibility. And whichever platform it is utilized from, developers can rapidly design and build applications because of its drag-and-drop workspace design. With DGLux5, organizations can link all data sources in one repository or application. This enables every member of the workforce to access information regardless of the primary origin so they can continue working efficiently and even enhance their productivity. Plus, DGLux5 is a lightweight solution. It ensures that other applications can still run smoothly by utilizing CPU resources minimally so servers can focus more on collecting and analyzing data. DGLux5 is capable of working on different platforms. This makes it a flexible and adaptable application that users can adapt to their variable needs. Because of this, developers can continue working on their projects even while they are aware from their workplace or are on-the-go. Regardless of their place of origin, pieces of data can be accessed from a singular workspace. That is because DGLux5 enables the linking of different sources such as a web database, social media channel, IoT device, and more. This allows members of an organization save time by searching for information they need on one window only. With the DGLux5 visual programming feature, users have access to revolutionary tools that allow them to gain meticulous control over their data. This enables them to make certain that every element behaves exactly the way they intended them to. Further, DGLux5 has a drag-and-drop environment that drives flexibility. Since DGLux5 runs in the browser, it does not tax CPU resources. Therefore, it lets users utilize their servers more for collecting and analyzing data. DGLux5 is designed to fit any screen size. It automatically scales and optimizes the interface to let users experience smooth programming regardless of the device they are working on. With DGLux5, developers can customize and tailor behaviors of objects in their application. This way, they can create unique and refined interactions and experiences for their target users. DGLux5 supports the crafting of applications for different devices. That is why it has tools that allow developers to specify responses for mouse gestures and touch screen gestures, replete with custom triggers for an amalgamation of interactions. DGLux5 is equipped with pie charts, column charts, bar and line charts, and many different kinds of data visualization tools. With these, users are capable of representing their data in different ways and through means that best display them. 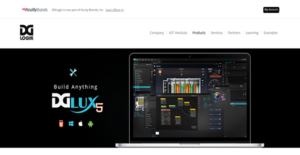 DGLux5 further assists developers in speedily producing applications with its vast library of graphics, widgets, and assets. So instead of starting from scratch, programmers can customize the resources that are already available to them. If you are considering DGLux5 it could also be beneficial to examine other subcategories of Best Rapid Application Development Software - RAD listed in our base of B2B software reviews. Each enterprise has its own characteristics, and may require a specific Rapid Application Development Software - RAD solution that will be designed for their company size, type of customers and staff and even particular industry they cater to. It's not wise to count on locating an ideal services that is going to work for each business regardless of their history is. It may be a good idea to read a few DGLux5 reviews first and even then you should pay attention to what the solution is supposed to do for your business and your workers. Do you need a simple and straightforward solution with only essential features? Will you actually use the complex tools needed by pros and big enterprises? Are there any specific features that are especially beneficial for the industry you work in? If you ask yourself these questions it will be much easier to locate a reliable service that will fit your budget. How Much Does DGLux5 Cost? We realize that when you make a decision to buy Rapid Application Development Software - RAD it’s important not only to see how experts evaluate it in their reviews, but also to find out if the real people and companies that buy it are actually satisfied with the product. That’s why we’ve created our behavior-based Customer Satisfaction Algorithm™ that gathers customer reviews, comments and DGLux5 reviews across a wide range of social media sites. The data is then presented in an easy to digest form showing how many people had positive and negative experience with DGLux5. With that information at hand you should be equipped to make an informed buying decision that you won’t regret. What are DGLux5 pricing details? What integrations are available for DGLux5? If you need more information about DGLux5 or you simply have a question let us know what you need and we’ll forward your request directly to the vendor.